Education Qualification : Passed Intermediate(12th) Exam in any Discipline from any Recognized Board. 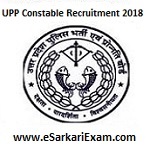 Eligible Candidates can Submit UPP Constable Application at the Official Website of PRPB latest by 8th December 2018. Click on All Notification/Advertisement Link. Click on Candidate Registration Link of Constable Civil Police, PAC Recruitment. Pay Application Fee Online or Offline.